MJF & SLS: what is the difference? 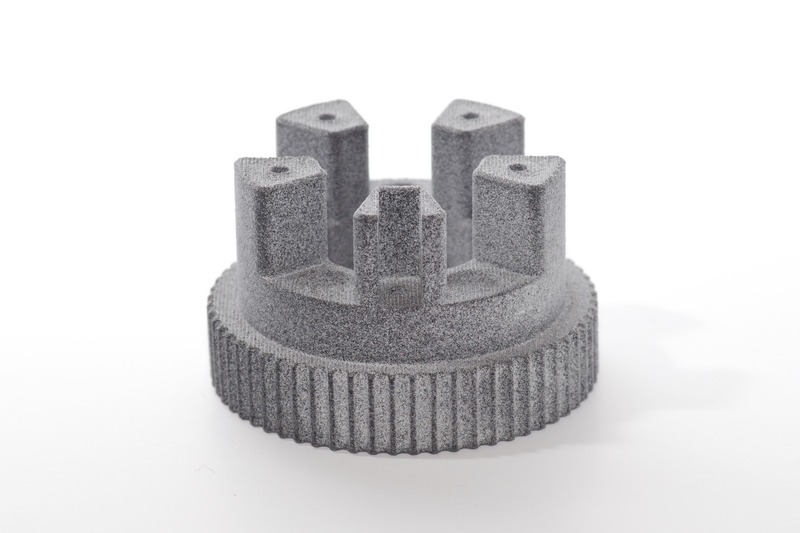 HP's Multi Jet Fusion (MJF) and Selective Laser Sintering (SLS) are two industrial 3D Printing technologies that belong to the powder bed fusion family. In both processes, parts are built by thermally fusing (or sintering) polymer powder particles layer-by-layer. The materials used in both MJF and SLS are thermoplastic polymers (usually Nylon) that come in a granular form. The main difference between MJF and SLS is the heat source. SLS uses a laser to scan and sinter each cross-section, while in MJF an ink (fusing agent) is dispensed on the powder that promotes the absorption of infrared light. An infrared energy source then passes over the building platform and fuses the inked areas. MJF is a combination of the SLS and Binder Jetting technologies. Since MJF and SLS create parts that are very similar, it is important for a designer to understand what slight differences should be expected when placing an order with either process. In this article, we compared the two technologies in terms of workflow, accuracy, materials, cost and lead time. Want to compare prices and lead times for SLS and MJF services in your area? A thin layer of powder is first spread over the build platform. A CO2 laser then scans each cross-section, sintering the powder. The platform then moves downwards one layer and the process repeats until the job is complete. The whole bin has to cool before the parts can be removed from the powder. A detailed article describing the mechanics of SLS can be found here. A thin layer of powder is first spread over the build platform where it is heated to a near-sintering temperature. A carriage with inkjet nozzles (which are similar to the nozzles used in desktop 2D printers) passes over the bed, depositing fusing agent on the powder. At the same time a detailing agent that inhibits sintering is printed near the edge of the part. A high-power IR energy source then passes over the build bed and sinters the areas where the fusing agent was dispensed while leaving the rest of the powder unaltered. The process repeats until all parts are complete. Similar to SLS, the printed parts are encapsulated in powder and need to cool down before they can be removed. In SLS each cross section is fused point-by-point, while in MJF fusing happens in a line-wise fashion. However, this does not change significantly the print time, as it is the recoating step (and the total number of layers) that mainly determines the total printing time, which is identical for both processes. HP offers a dedicated post-processing station that speeds up the cooling rate of the printed bin and helps with powder removal. In MJF the recovered powder can be 80-85% recycled and reused, while in SLS the powder is only 50% recyclable. Faster cooling times and greater recyclability means that MJF machine operators are less hesitant to start a job when the bin is only partially full, while SLS machine operators will often wait for a bin to fill before starting printing. This key difference in the workflow results in shorter lead times (as we will see in the case study below). Both MJF and SLS are industrial technologies that offer high dimensional accuracy. However, MJF has a small edge over SLS as can be seen in the table below. This is mainly because MJF printheads deposit material at 1200 DPI (or approximately 1 dot every 0.022 mm), while the typical laser spot size of SLS system is approximately 0.3 - 0.4 mm in diameter. Also, the detailing agent used in MJF helps with printing small features and sharp edges. Notably, neither technologies require support structures, allowing the creation of free-form models without any support removal marks, and are both susceptible to warping, so large flat areas must be avoided. In our testing, we experienced that MJF parts were more prone to warping than parts printed with SLS. * : The recommended minimum wall thickness of structural areas for both technologies is 1 mm. The fusing agent currently used in MJF systems is black in color because dark materials absorb radiation more effectively. 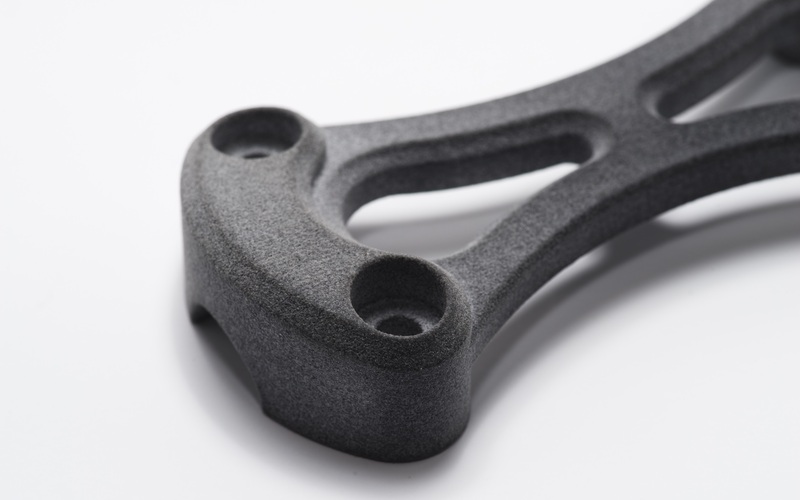 As a result, MJF parts have a light grey appearance. An optional post-processing dyeing step can be applied to achieve an uniform black finish. SLS parts are usually printed white and can be dyed to any color. 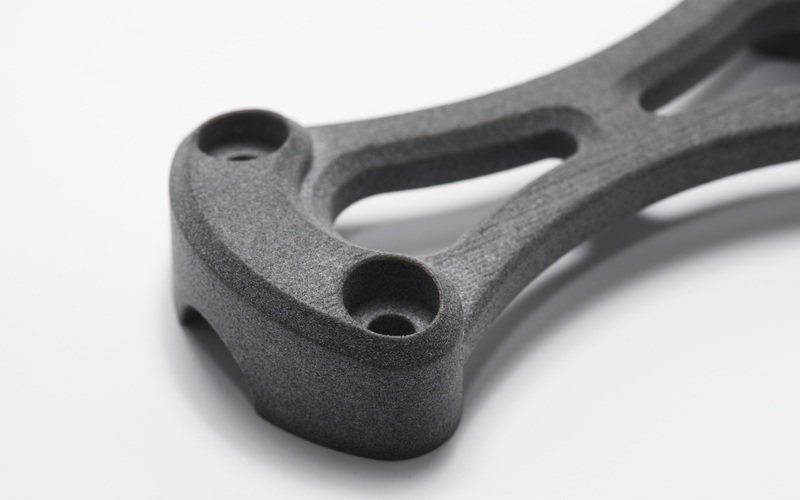 Grey SLS nylon powder is also available and parts printed in this material have a very similar look to MJF parts but are smoother to the touch. 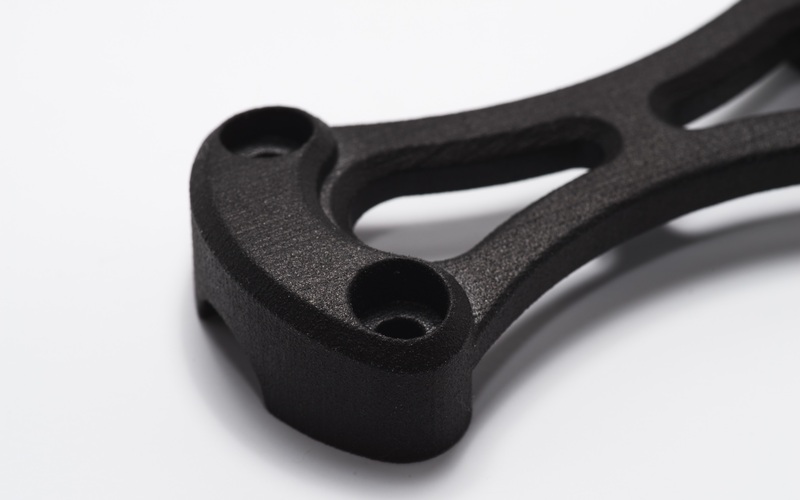 Parts printed in both technologies have a grainy surface finish, but can be post-processed to a very high standard. If aesthetic appeal is the main requirement, dying is highly recommended. The main material used in both processes is PA 12 (nylon). 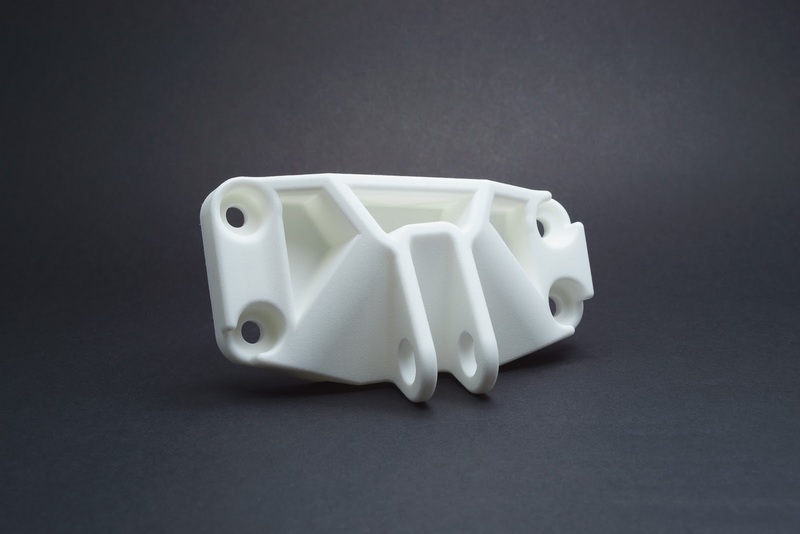 When printing in this material, MJF parts have superior strength and flexibility and more homogeneous mechanical properties compared to SLS parts, which are weaker along the print direction. However, SLS printers offer more material options, such as carbon filled PA, aluminium filled PA (alumide) and flexible TPU. Moreover, SLS is a well-established and well-studied process. The properties of SLS materials are thoroughly documented by both manufacturers and independent researchers. On the other hand, only PA is currently available in MJF and important engineering properties, such as impact strength and creep characteristics, are not widely available. Of course, this is expected to change as the technology matures and because MJF is an open material platform, allowing for faster material development. To assess the two technologies in terms of cost and lead time, an experiment was conducted on the 3D Hubs platform. 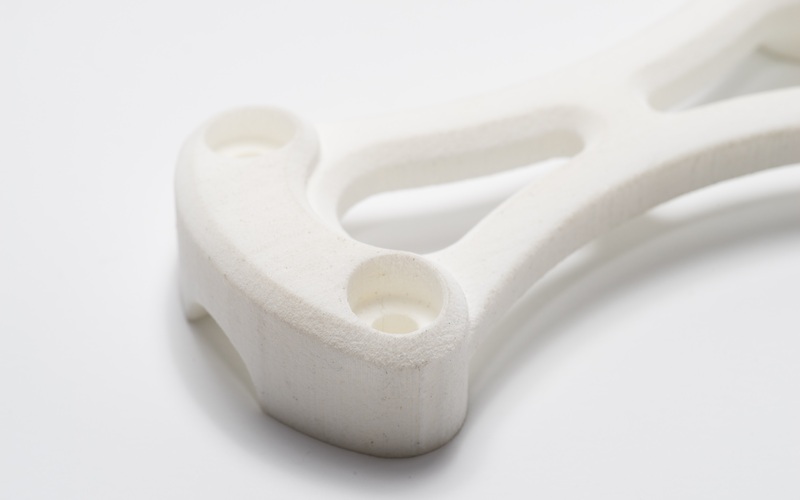 Quotes from 6 different 3D print services in the US for each technology were requested, for a one-off print and a small batch production (30 parts). The model used in this test was the bracket pictured below. It has a volume of 23.8 cm3 and bounding box dimensions of 101.9 x 45.0 x 18.0 mm. You can view and download the STL file here. For one-off parts, MJF and SLS have about the same cost. However, for small batch production, SLS was on average slightly more economical (by less than 10%). A significant difference was seen in the lead time: MJF orders were delivered on average 3 days faster than SLS orders. This showcases that the MJF workflow (cooling, post-processing etc) is noticeably faster than the SLS workflow and that this has a significant effect on the lead time. While SLS will always be able to produce parts from a single material only, in MJF a part can have different material properties by changing the type or concentration of the fusing agent. HP claims that it is possible to control this way the mechanical, thermal, optical and even electrical properties of a part. This functionality is not yet available in the first-generation machines though, which can only manufacture parts from a single material. The second generation HP printers is supposed to support multi-material and multi-color printing, but more information is currently not available. On the other hand, a number of printers SLS have recently been developed aiming to introduce a price competitive desktop SLS solution. While these systems have great potential, at the time of writing it is still very early to properly assess their impact will have on the industry. Both MJF and SLS are capable for producing functional parts with good dimensional accuracy, smooth surface and free-form geometry. The physical properties and mechanical behaviour of SLS materials is well-documented, but comprehensive data for MJF are not widely available. The cost of MJF and SLS is similar, but the MJF lead time is on average 3 days faster.